Archivematica also supports conventions for importing descriptive metadata and rights metadata that will transpose the contents of the metadata files into the METS file. Metadata in the METS file is searchable in the Archival Storage tab. Archivematica natively supports the Dublin Core Metadata Elements Set, the basic 15 Dublin Core metadata elements. Using the metadata.csv method, users can also include non-Dublin Core metadata at the directory level or at the object level. Archivematica is able to pass Dublic Core metadata to AtoM or ArchivesSpace, but not any non-Dublin Core metadata. Dublin Core metadata is written to the <dmdSec> of the METS file as MDTYPE="DC". Non-Dublin Core metadata will be written into a separate <dmdSec> as MDTYPE="OTHER". A sample of the METS output is available below. 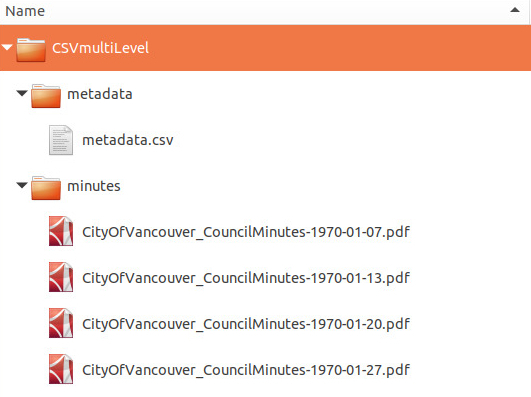 As of version 1.4, both directory and object level metadata is allowed in the metadata.csv. The CSV can contain only object level, only directory level, or a combination of both. For simple objects, digital objects should be placed in the top-level directory. Dublin Core field names must contain the “dc” element in the name, e.g. “dc.title”. Note that the Dublin Core is not validated – this is up to the user. Dublin Core terms must contain “dcterms” in the name, e.g. “dcterms:abstract”. As above, the Dublin Core is not validated – this is up to the user. The first column in the metadata.csv file must be a “filename” column. This column should list the filepath and filename (e.g. “objects/BrocktonOval.jp2”) or directory name of each object or directory (e.g. “objects/Jan021964”). Note that the filepath or directory path must start with objects/. This is a legacy artifact when all digital objects in the transfer had to be nested in such a way. If you have directory level metadata, fill out the fields on the same line as the directory (e.g. objects/). All Dublin Core elements are used to generate a <dmdSec> for each directory or file with MDTYPE="DC"
All non-Dublin Core elements are used to generate a <dmdSec> for each directory or file with MDTYPE="OTHER" OTHERMDTYPE="CUSTOM"
The <dmdSec> are linked to their directories or files in the <structMap> section of the METS file. This section provides CSV and METS file examples for simple objects – i.e. individual files that are not pages in a compound object such as a book or a newspaper issue. Below is a snippet of the METS file, containing two descriptive metadata sections (<dmdSec>), one for each file. These contain the Dublin Core metadata parsed from the metadata.csv. Note in the <mdWrap> that they are given an MDTYPE of “DC”. If there had been non-Dublin Core metadata in the metadata.csv, there would be a separate <mdWrap> with an MDTYPE of “OTHER”. This section provides CSV file and METS file examples for compound objects – i.e. multi-page digital objects such as newspapers and books. You can enter multiple acts for the same rights basis. Rows for the same object with the same rights basis will be treated as separate acts for the basis and merged. For example, the first two rows below will be merged, while the third row will be separate. You can read more about rights metadata here: PREMIS metadata in Archivematica.